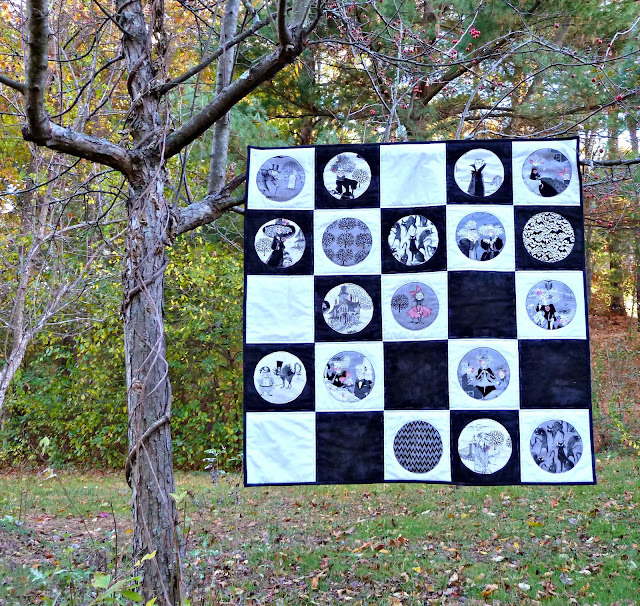 I had the idea for this quilt last year but never got a chance to make it and it's been haunting me ever since. As soon as October rolled around I started having all sorts of Ghastly thoughts:-) I pulled out my stash and immediately got to it. 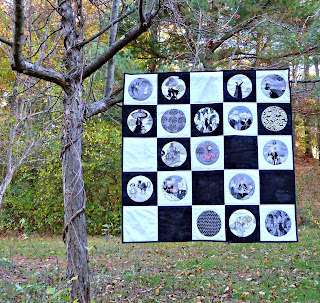 There are tons of great tutorials on how to make a circle quilt out there. Mine is loosely based on this Liberty Mini (which I'm totally going to make someday) by Purl Soho. I used the Easy Circle Cut ruler to cut my circles out of sheer fusible interfacing (Pellon 906F) then pinned this to my printed fabric so the fusible side is facing the right side of the fabric. 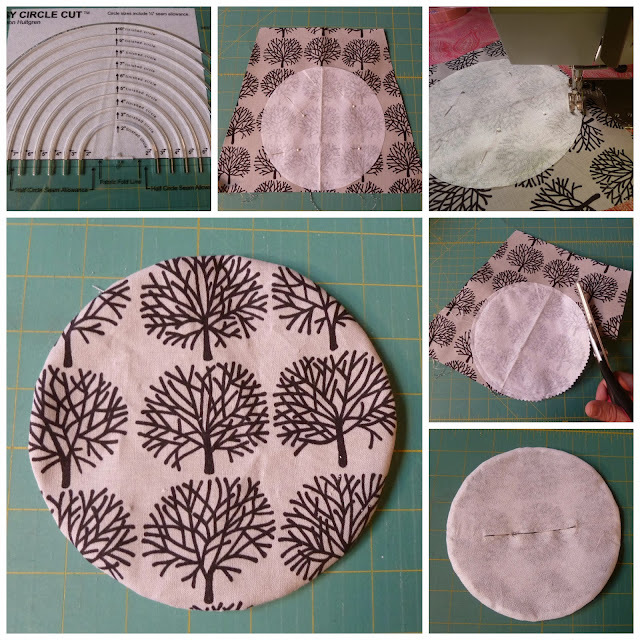 Stitch around the circle using a 1/4" seam allowance and then trim your circle using pinking sheers so you don't have to worry about clipping the curves. 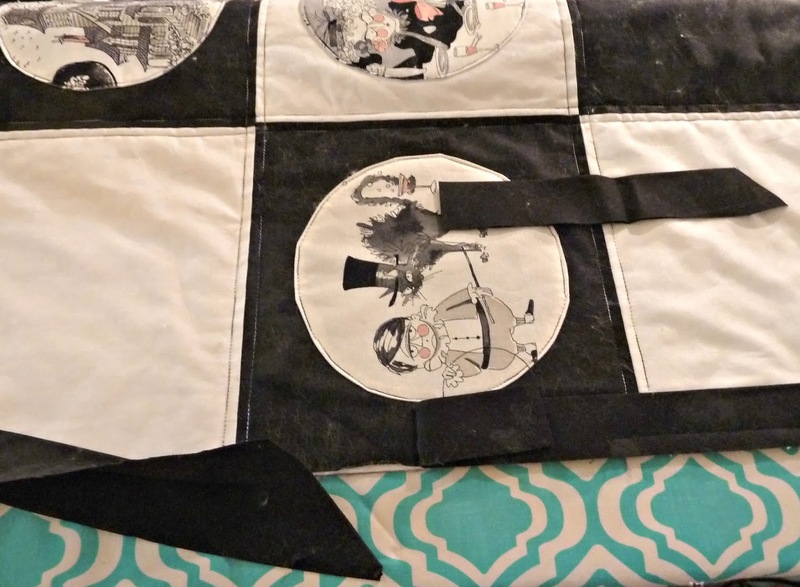 Make a small slit in the fusible and turn the circle right side out. DO NOT IRON!!! Once all my circles were made I assembled the checkerboard background, basted it, and quilted 1/4" on either side of the seam lines. Once I arranged the circles the way I wanted I fused them to the quilted top and then quilted around each circle. I was totally inspired by the fabulous presentation by The Story of Kat at our October BMQG meeting on hand-embroidered quilt labels. My text is a little too tight and I definitely need to work on my stitches but I'm learning to embrace imperfection. Go find your inspiration at the Blogger's Quilt Festival!!! 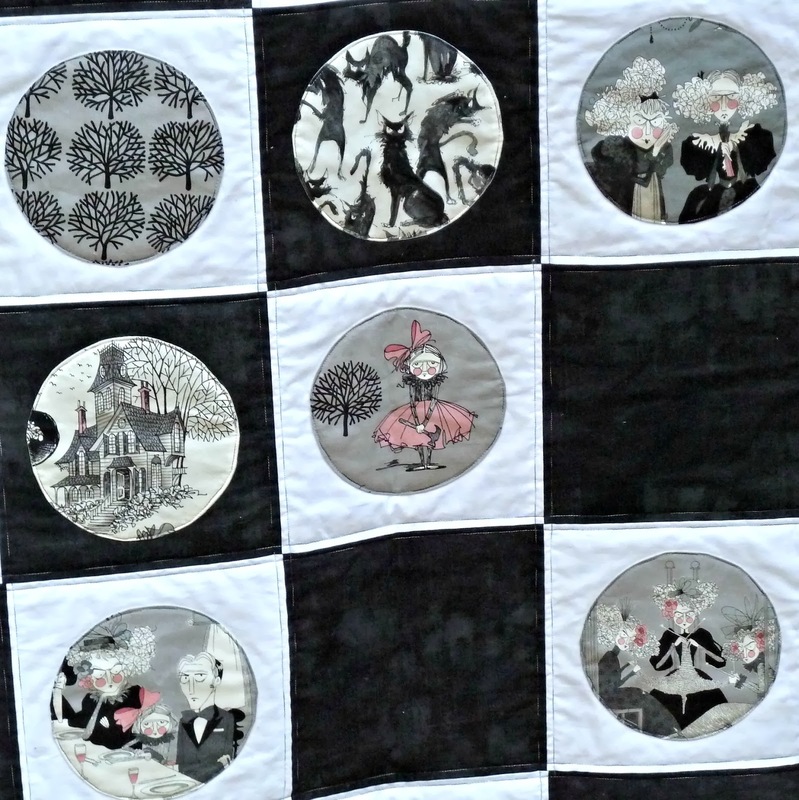 Finished quilt is 40" x 40"
I love this, now I'm going to need to make another ghastly wall hanging using your circle idea. I think it will look perfect with the Holiday Ghastlies, my mind is spinning with ideas. Thanks. 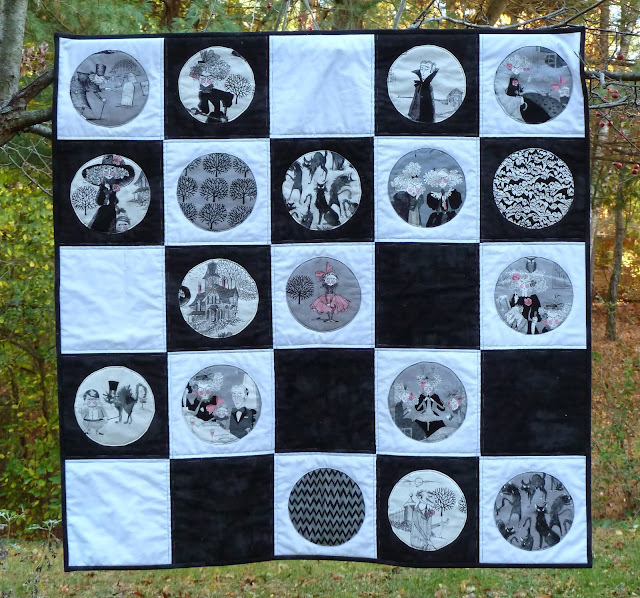 Great ghastly quilt! Love the checker board style of the pattern. Perfect way to showcase those beautiful/wicked ghastly fabrics! I love this! That setting is perfect for those fabrics! Fantastic fussy-cuts and the setting has such a retro-mod feel to it! Love it. A great way to show case those Ghastlies.